Acquired by PAF.com in 2011. A leading interactive gaming company providing users with a social, multiplayer, user-centred experience. The Company was founded in 2002 and is headquartered in Stockholm, Sweden. Jadestone Group AB is a leading interactive gaming company providing users with a social, multiplayer, user-centred experience. The Company was founded in 2002 and is headquartered in Stockholm, Sweden. The Company’s client list includes industry leaders such as bwin, Unibet, Betfair, Gala Coral and Paf. 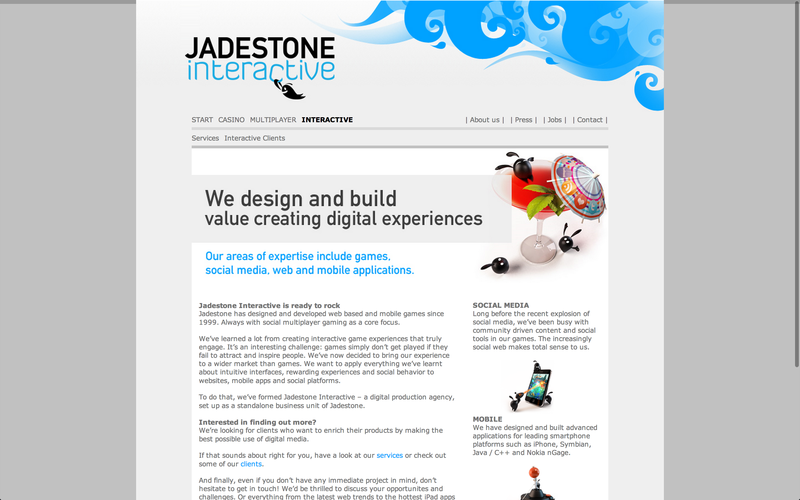 Jadestone prides itself upon being a leading innovator and change leader in the eGaming market by our consistent focus on highly polished look and feel, multiplayer features and complete end-user satisfaction.